Based on the manga of the same name, Takashi Miike’s Ichi the Killer courted instant controversy upon its release in 2001. The film has been banned in some countries, including Malaysia and Norway, and heavily censored in many others, including the United Kingdom and Germany. Its depiction of extreme violence was deemed so excessive, that sick bags, adorned with the film’s logo, were passed out to viewers at the Toronto International Film Festival. The film’s violence is masterfully gory. Blood gushes from open wounds like a shaken-up soda, and characters that stand in the way of the titular Ichi often find themselves missing limbs, heads, or severed in half. For those with weak constitutions, this film is certainly one to skip. The violence is truly exceptional. The story concerns Ichi (Nao Omori), a mild-mannered man with few social skills or attractive traits. However, when upset, Ichi is prone to bursting into tears and flying into a psychopathic rage, coupled with disturbing sexual desire. He styles himself something of a superhero, killing pimps, yakuza members, and general ne’er-do-wells in an attempt to clean up his town. His counterpart is Kakihara (played with a dangerously magnetic attraction by Tadanobu Asano), a Yakuza lieutenant with a sexual desire for pain (both giving and receiving). After the leader of his gang is murdered, Kakihara sets about finding the man who did it. The events that follow put Ichi and Kakihara on a collision course towards each other, culminating in an epic final showdown. If one can get past the violent imagery, there is a lot in Ichi the Killer worthy of discussion. Themes of violence against women, power and control, and questions of what is “right” echo throughout the film. The mad, alluring Kakihara is an obvious villain; the generally unassuming Ichi’s character is more open to interpretation. The shadowy Jiji, a mysterious figure who appears to have ties to Ichi, Kakihara, and the other Yakuza clans, also presents interesting moral questions. 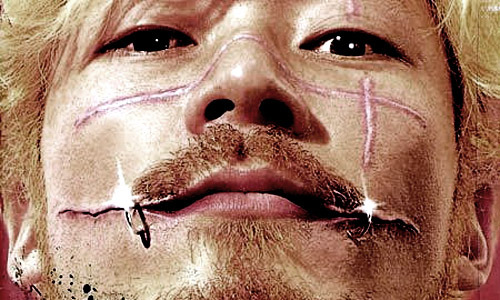 The violence and sexual imagery of Ichi the Killer will turn off some viewers, who may find themselves asking “why” after witnessing only a few of the film’s gristly death scenes. To answer that question, one must turn to the film’s director, Takashi Miike. For Miike, the violence’s extremity clearly situates it in the realm of fantasy. The violence in the film is fantastical; death is delivered via blade in a multitude of interesting ways. This keeps the film from being too real, though the fountains of blood and discarded body parts may speak otherwise. There is a legitimate concern about seeing Ichi the Killer, and if one doesn’t enjoy cinema violence, this won’t be the film to convince them. However, for those that enjoy gore, or those who are willing to look past it in search of a greater cinematic experience, Ichi the Killer is an excellent piece of cinema that must be seen to be believed. For those who still aren’t sure, this trailer serves as a good introduction to the film’s style and content.